Talking to IGN TV recently, The Flash's Grant Gustin went into great detail about what's to come in the second half of season one, with one of the most revealing points being how the public learn that The Fastest Man Alive is protecting Central City. He also drops some hints about what's to come following the battle with the Reverse-Flash, and the arrival of Mark Hamill's Trickster. The actor also goes into detail about the somewhat unsurprising season two renewal of The Flash, and shares his thoughts on a possible crossover with the Greg Berlanti produced Supergirl which will debut on CBS. Much more from the actor can be found by clicking on the link below, but here are just a handful of the highlights. What do you guys make of Gustin's comments? I think because of the talk that Barry has with Joe after that fight and everything, I think he’s not necessarily down on himself. I think he’s ready to move forward. Cisco has come up with new ways for Barry to train and Barry’s kind of refocused his energy on being ready for the next time and not really beating himself up too much for losing the first battle. He also gets distracted, as usually happens - he’s distracted by other villains coming in and other personal things in his life. Barry isn’t really weighed down by anything. I talked about it a lot earlier on, but in general with Barry -- Geoff Johns said it best -- is with an anchor you don’t cut it off and leave it at the bottom of the ocean, you pull it up and carry it along with you. He lost that battle with the Reverse-Flash but it’s not going to stop him. He’s going to keep moving forward and he’s going to be ready for the next time. It changes things. it’s unexpected, first of all, initially. It does prove to be too much in some ways and Barry needs some help, some back up, and many more people are about to find out about the Flash’s existence and not just the rumor of ‘The Streak’ but that there is this superhero protecting the city. And that is because there is, as you saw, a very public battle that’s going to take place. It’s unbelievable, kind of. All the guest stars have been really amazing. Victor Garber, the fact that we got him blew my mind. Clancy Brown, who’s been in so many award-winning films and Tom Cavanaugh is a series regular, and Jesse L. Martin I’ve been a fan of my whole life. 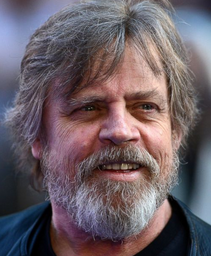 But Mark Hamill, that’s kind of a different type of holy s**t, you’re one of the most legendary iconic characters of all time. So it’s really f**king cool and I’m really excited to meet him and his storyline has some really cool twists involved that are connected to his stint from 25 years ago on the Flash which is cool that we’re doing that nod. It’s really exciting. I hate to say - it’s not like we expected it, but it’s also not surprising me, I guess. It’s why I was so excited to get to be a part of this early on. I knew it was a character that was long overdue, and that if they did the effects right, which seemingly they were going to do with early stuff they showed me… I’ve been excited since the very beginning because I knew that we had the potential for this type of success. We all feel really fortunate and I’m having so much fun. I’m just glad I get to do more of it. It all feels like one, big experience thus far. I don’t think I’m going to really be able to look back and appreciate each little moment until this first season’s over. Maybe even later down the road, I don’t know. It’s all just one big thing that I’m kind of a day at a time right now. It’s hard to look at the big picture. Supergirl, yeah. It also is exhausting to think about. But, if they’re like, “Hey we’re doing Supergirl now and we want the Flash to be on a Supergirl episode,” I’m going to get excited about that and then after that worry about how we’re going to make it work. But yeah, of course! I’m down. I’m down for any type of cool crossover as long as we can make it work. We now know that Harrison Wells is the (a?) Reverse-Flash, but is that all there is to the story? We've heard lots of hints that another may appear or that there will be some kind of twist in regards to the villain's true identity, something Grant Gustin also alluded to in a recent interview with Entertainment Weekly. "Barry is still defending Wells and still trusting of Wells at this point," he told the site. "There’s a big twist that even surprised me. I’ve seen all the predictions online. No one has predicted the big twist that’s coming at the end of this season." When we pick up with Barry in the midseason finale, the actor adds that The Fastest Man Alive (or so he thought) will be training to outpace Reverse-Flash to prepare for the next time they meet. "He’s trying to get faster and not just straight up speed, but his agility and maneuvering within it and what he can do with this speed. He has a bar set. He has to be at least as fast as the Reverse Flash." 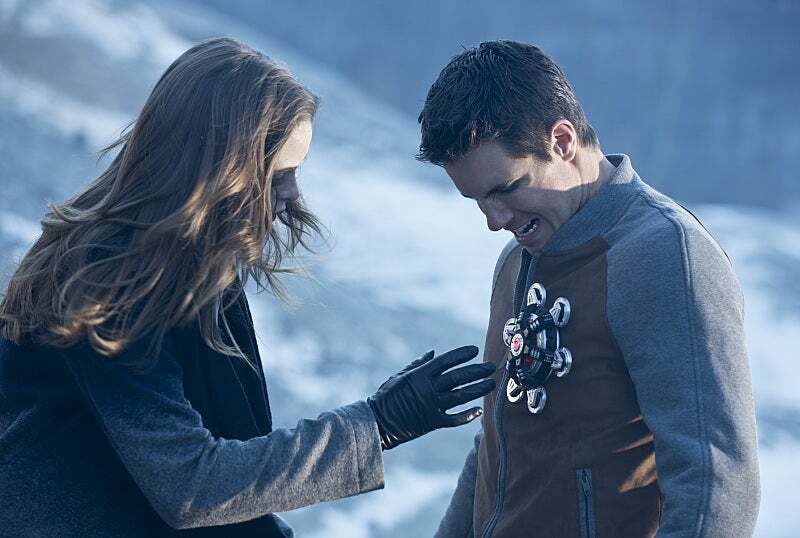 Elsewhere, Caitlin Snow will still be trying to uncover the details behind Ronnie Raymond's transformation into Firestorm, something which will pay off for viewers in a big way according to executive producer Andrew Kreisberg. "She discovers the truth of Firestorm and decides she has to let it go because Ronnie is no longer Ronnie anymore. Episode 13 is called ‘The Nuclear Man,’ and we have Victor Garber and Robbie Amell in that episode, so you’re going to get a lot of the answers of what happened to Ronnie the night of the explosion. Even episodes 10, 11, and 12 have bits of the puzzle to figuring out the secret behind Firestorm, and then General Eiling, played by Clancy Brown, shows up because Firestorm is his new target." What do you guys think? WENTWORTH MILLER AND DOMINIC PURCELL (“PRISON BREAK”) TEAM UP AGAINAS CAPTAIN COLD AND HEAT WAVE CHALLENGE THE FLASH TO AN EPIC BATTLE —Leonard Snart AKA Captain Cold (guest star Wentworth Miller) returns to Central City with a newhotheaded partner in tow – Mick Rory AKA Heat Wave (guest star Dominic Purcell). The duo planto steal a multi-million dollar painting, but Cold has another agenda while in town – to set a trap forThe Flash. Snart and Mick kidnap someone close to The Flash and threaten to kill them unless TheFlash shows up for a battle of fire and ice. Barry tells Joe (Jesse L. Martin) he isn’t sure he shouldtake on Snart again after the casualties that happened the last time they fought. Meanwhile, Barryasks Dr. Wells (Tom Cavanagh), Caitlin (Danielle Panabaker) and Cisco (Carlos Valdes) to help himdouble his training efforts so he’s ready for the Reverse Flash when he returns to Central City. Iris(Candice Patton) deals with the aftermath of Barry’s confession, and Cisco makes the CCPD a newshield. Nick Copus directed the episode written by Geoff Johns & Kai Yu Wu. You can get a look at both sides of Firestorm (Ronnie Raymond and Dr. Martin Stein) as well as details on how both men have been battling for control of the same body for the past year and news on the costume evolving over the coming weeks and months after the jump! Firestorm made his presence felt in the midseason finale of The Flash, but there's still an awful we don't know about The CW version of the fan-favourite character. In a recent interview with Comic Book Resources, both Robbie Amell (Ronnie Raymond) and Victor Garber (Dr. Martin Stein) weighed in on their respective portrayals of each half of Firestorm and how that will play out in upcoming episodes. "Our first episode together, we're supposed to have been battling for control mentally against each other for over a year now, so there would be a familiarity -- and we already had that," Amell tells the site, before adding: "We haven't gotten to do too many scenes like that yet, but from what we've shot, there's definitely a frustration with each other. We spend a lot [of time] in my head, battling for control. You spend a year that close to somebody, you need some time apart, so I think a little bit of the humor comes from us wanting nothing to do with each other, and being brought back together and having to team up to help out Flash. I'm really excited for future episodes, where we will get to have a little more fun together." Garber meanwhile had this to say about what it's like to be stuck in Ronnie's head, and it appears as if we should expect the usual Firestorm dynamic from the comic books. "In my second episode, we come together knowing that we have a responsibility, and we both take that seriously. Frustration happens at first -- where I just say, "You're an idiot, I just want to get out of here" -- but then, as things progress, we realize that we have a responsibility, and we both accept that. From there on, of course, there will be banter and conflicts, which is what makes it fun." Finally, Amell was asked about the costume (which you can see in the image above) and whether it will evolve into a version closer to the one from the comics which is also pictured above. Based on his comments here, it sounds like it will! "It's got a lot of evolution to go through. It will definitely evolve. Right now, it just happens to be the wardrobe I was wearing when the splicer gets put on. The splicer is really the only piece of the costume that I think will be consistent, and that'll be a staple. I think the rest of it is interchangeable." What do you guys think of these comments? Grant Gustin Talks Time-Travel On THE FLASH; Is a Flashpoint Storyline In The Works? "We are diving deep into the time-travel element and it is going to be wild," said Barry Allen actor Grant Gustin on the battle between Flash and Reverse-Flash. "I think it would be fun if [time-travel] totally changed the show for season two." We learned previously that The CW's Flash superhero drama would explore the concept of time-travel in episode 15 and now the show's star, Grant Gustin has shared some details with THR. "We are diving deep into the time-travel element and it is going to be wild," teased Gustin. He adds that he hopes time-travel will be a component of the show for many seasons to come. "I think it would be fun if [time-travel] totally changed the show for season two." Could a Flashpoint-style, elseworlds season 2 be in store for The CW's Flash? DC Entertainment Chief Creative Officer has already introduced a number of his comic book creations and concepts on both of The CW's superhero drams; however, the whimsical storyline of Flashpoint-1 lends itself better to The Flash than Arrow. In fact, Gustin has been hinting at Flashpoint since the pilot episode first aired. . "We're going to slowly find out more about Harrison Wells and what the hell is going on there", said Gustin back in August. He continued, "What the coolest thing about that moment, to me, is they're setting up the fact that the Flashpoint story line [from the comics] could potentially happen — that Speed Force could be an aspect and time travel is potentially a part of the show." THE FLASH Season 1, Episode 13 Description; "The Nuclear Man"
Firestorm is coming to The Flash in "The Nuclear Man", and it sounds like he'll be the latest dangerous metahuman targeted by the Scarlet Speedster! Meanwhile, there are also details on Barry Allen's relationship with Linda Park, Nora Allen's murder case, and more. Check it out! ROBBIE AMELL AND VICTOR GARBER GUEST STAR AS FIRESTORM — After Ronnie (Robbie Amell) attacks a physicist (Bill Dow), Barry (Grant Gustin) and the team realize they need to go after Caitlin’s (Danielle Panabaker) fiancé who is now a dangerous meta-human. They deduce the best way to track Ronnie is to find Dr. Martin Stein (guest star Victor Garber) who was working on a project called F.I.R.E.S.T.O.R.M. Barry struggles to balance his duties as The Flash and his relationship with Linda Park (Malese Jow), and Joe (Jesse L. Martin) enlists Cisco’s (Carlos Valdes) help to reinvestigate the murder of Nora Allen (Michelle Harrison). 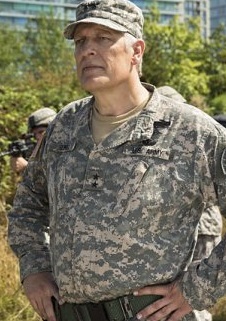 General Eiling (Clancy Brown) returns to Central City. Glen Winter directed the episode written by Andrew Kreisberg & Katherine Walczak. I'm guessing that this will be the episode which finally sheds some light on what's going on with Firestorm, and wouldn't be surprised to see him ultimately suiting up as a member of Team Flash. We'll have to wait and see though. Elsewhere, there's still no mention of Reverse-Flash, but the investigation of Nora Allen's murder could lead to his return! 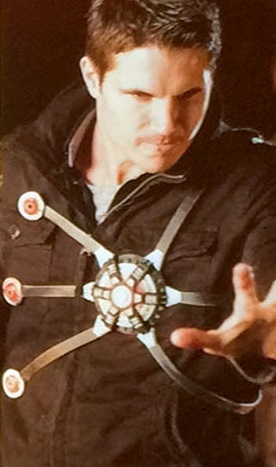 Robbie Amell stars as Ronnie Raymond/Firestorm in The Flash. His cousin of course is Stephen Amell (TV's Green Arrow). Recently Robbie sat down with Collider and talked about his role on The Flash and what we can expect from his Origin story. AMELL: My cousin (Stephen Amell) is Arrow so I’ve seen the unbelievable ride he’s gone on and the amount of fan base that they’ve built. When they did The Flash crossover episode — not this season on The Flash and Arrow – it kind of acted as the first episode of The Flash or the first time that they introduced Flash. You could see that there was going to be something really special there. Grant (Gustin) is so great and the cast they put together is so unbelievable. And The Flash is just such an iconic character. I feel like they’ve really done it right. The visual effects are incredible. They’re pulling all the stops on this. I’m just really excited for all of them. It kind of is what I expected it to be. I expected it to be this big. I would have been a lot more surprised if it wasn’t this big. AMELL: They were actually the two best episodes of both shows that I have ever seen. I thought that it was the best episode of Flash and the best episode of Arrow. I just thought they were so great. Flash added a little bit of comedy to Arrow and Arrow added a little darker grittiness to Flash. I thought they worked unbelievably well together. I know how hard the cast worked for those episodes because they’re already shooting such incredible hours on each show individually. To go and wrap one show and go shoot the crossover with the other, it was well deserved. Regarding a possible spin-off for Firestorm? AMELL: I don’t know. I mean, they always talk about it. But the tough thing is they’ve already got The Flash. They’ve got Arrow. They’re doing a Super Girl show on CBS. All the people involved are very busy. Who knows? 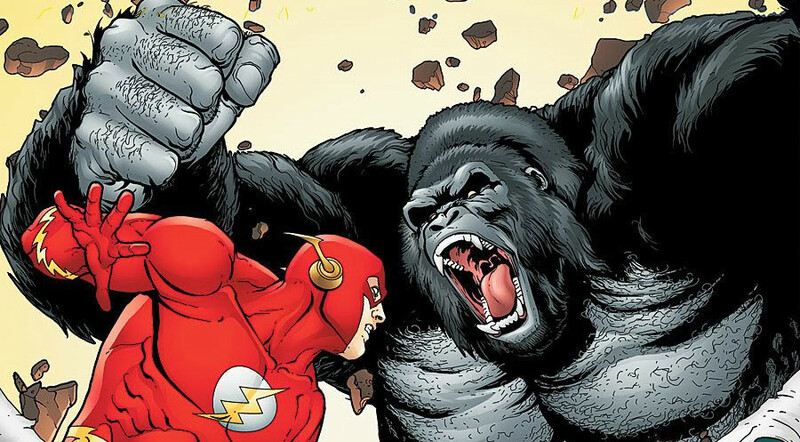 The showrunners behind The CW's Flash have previously teased the creation and appearance of Gorilla Grodd this season but according to executive producer Andrew Kreisberg, Grodd will soon make his debut. Apparently The CW is polishing up some VFX for Gorilla Grodd's debut on The Flash which means the DC Comic super villain is likely to make his formal debut before the conclusion of Season One. With the focus on Reverse-Flash and the rest of the Central City Rogues, it will be interesting to see how Kreisberg and Geoff Johns weave Grodd into the overarching storyline of Flash's quest to confront his evil doppelganger and prove his father's innocence. Major 'Firestorm' SPOILERS In THE FLASH Season 1, Episode 14 Description; "Fallout"
The official description for episode fourteen of The Flash drops some huge details about what's to come for Firestorm in the hit CW series as General Eiling sets his sights on capturing Central City's newest hero! There are also some very intriguing hints about time travel. Check it out! GENERAL EILING TARGETS FIRESTORM — After the nuclear explosion separates Ronnie (guest star Robbie Amell) and Dr. Stein (guest star Victor Garber), Barry (Grant Gustin) and the team believe both men are safe. Caitlin (Danielle Panabaker) is thrilled to have her fiancé back and prepares to resume their life together while Dr. Stein returns to his wife. However, when General Eiling (guest star Clancy Brown) targets Firestorm, Ronnie and Dr. Stein must decide if they are safer together or apart. Meanwhile, Mason Bridge (guest star Roger Hayworth) tells Iris (Candice Patton) that there is something secretive going on at S.T.A.R. Labs and Dr. Stein gives Barry some important information about time travel. Steve Surjik directed the episode written by Keto Shimizu & Ben Sokolowski. So, Firestorm will indeed be split into two! The show is obviously going to delve into what happens when they combine though, and this unexpected element of The Flash may just end up being as interesting as the mystery surrounding the Reverse-Flash! Speaking of which, there's still no sign of that villain, but we will at least learn more about time travel in this episode. What do you guys think? Here's a synopsis for the 13th episode, "Nuclear Man". (Note that this isn't the ep the Trickster will debut in). If The CW's Flash really, truly pulls off Flashpoint, we're all in for a treat. But can they pull it off? And will it affect Stephen Amell's Arrow? 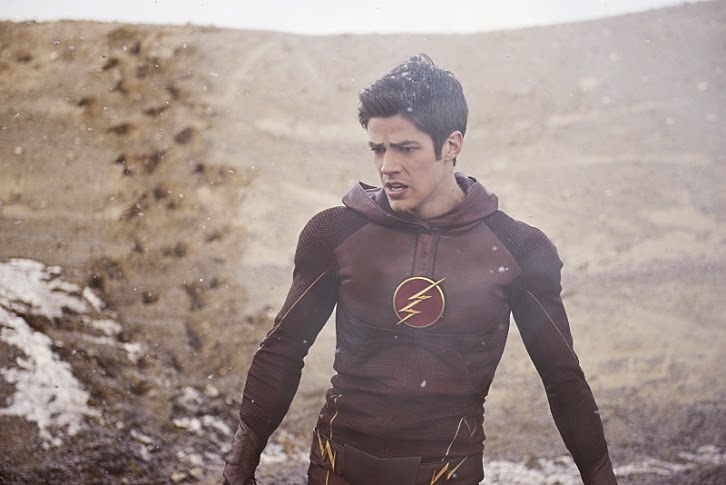 Check out the hint from Grant Gustin concerning the direction of The CW's superhero drama. In the past DC Entertainment Chief Creative Officer and consultant/writer on The Flash and Arrow has proven that he has no qualms about introducing his own creations/concepts on either show. And incidnetally, Johns is the mastermind behind the 2011 DC Comics miniseries that saw Barry Allen discover the ugly reality of altering the past for personal gain. Now a word of caution is definitely advisable here, as there's still no official confirmation but for all intents and purposes, it appears that The Flash is building towards a Flashpoint moment. The episode opens on a spiraling shot of a family trapped in a car, whcih is overturned with a live wire nearby. The Flash rushes to their aid, passing by a group of firemen and vibrating the car doors until they come loose, then rushing the family out. It briefly appears as though a kid is trapped in the car, but The Flash has saved them at super-speed. Back at S.T.A.R., they discuss Barry's training, and that his speed keeps increasing. Barry leaves to go have movie night with Joe rather than going out with Cisco and Caitlin for drinks. Caitlin has found Cisco's tablet, where he's researching F.I.R.E.S.T.O.R.M. She chastises Cisco for continuing to pursue it, saying it's time for her to move on, but Cisco says she hasn't actually done so. Outside of Iron Heights, a woman scouts the place out, then teleports inside, avoiding guards and crashing security cameras as she goes. She arrives at a cell, then teleports herself inside; she tells the inmate to grab her hand and then teleports them into the getaway car. The two kiss, then escape. Elsewhere in the prison, later, Barry Allen has found organic particulates; it's a trail that leads outside. Joe brings Henry to see him, and Henry says that the prisoners wouldn't talk about it with cops even if they knew. He has faith in Barry, and is led away. At her apartment later, the girl and her boyfriend are discussing her powers, which she hasn't connected with the particle accelerator. She tells him that she'd been having random power issues for a while, but that she got him as soon as she knew how to use it. She wants to run, leave town and run off together. He says they can't until they use her powers to get his debts paid off. At S.T.A.R., they analyze the particulates, finding DNA in them. They trace it to Lashawn Baez. Barry and Joe leave. In the holding cell below the labs, Cisco goes to Piper to ask him about Ronnie; Professor Stein was in S.T.A.R. Labs the night of the explosion and he wants to know why. Piper tells him that the mystery isn't why Stein went to S.T.A.R. Labs, but why he didn't leave. He says he can't tell him and has to show hiim, but Cisco says he won't let Piper out. Piper tells him that he knows how important Cisco's S.T.A.R. family is to him and that eventually he'll help him out of the cell to help his family. At Jitters, Barry tells Iris about his time at the prison. Iris tells him that she's having trouble at work because she's worried about getting fired if she can't find a great story. Barry says he'll help her find something. At S.T.A.R., Cisco tells Piper that if he's going to let him out, he isn't taking any chances, and brings a pair of high-tech bonds. At the prison, Barry and Joe are visiting Henry, who tells them about Clay Parker, the escapee, and his troubles owing money to drug dealers. At S.T.A.R., Piper shows Cisco a "bomb shadow" he says belonged to Dr. Stein. He tries to run away and Cisco incapacitates him with a sonic weapon. He says that he'll tell Cisco where Ronnie is, but he has to take off the bonds, as they'll be conpicuous where they go next. At the lab, Barry and Caitlin lament having no social lives, when a call comes in: Parker and Baez are at work. Barry runs to stop them as The Flash and after a brief confrontation with Baez, he's momentarily incapacitated bya gunshot and she grabs Parker and teleports away. At S.T.A.R., Barry tells them that she can teleport; Caitlin names her Peek-A-Boo and S.T.A.R. set about trying to think of a way to stop her. Barry leaves to go help Iris with her story, but she's going out to have dinner with Eddie and his mom. Barry calls Caitlin to ask what bars the villains used to go to, and the pair decide to go out to a few bars to watch for them. They end up at a karaoke bar, where Barry is impressed by how Caitlin looks. She suggests that they should both look for the bad guys and try and find dates. Caitlin knocks back a couple of shots and starts a tab. In an office, Cisco and Piper are watching security tape of the night of the explosion. They figure out that dark matter had merged Dr. Stein with Ronnie. As Cisco is distracted by the footage, Piper attacks him using a sonic attack from his hearing aid and runs. At the bar, Caitlin is drunk and calls Barry to the stage for a duet. Afterwards, when she excuses herself to go to the bathroom, Barry meets Linda Park, who was really impressed by his singing. She gives him her phone number, and goes. Caitlin comes back out of the bathroom, saying she needs to go home. At the drug dealer's hideout, Peek-A-Boo and Parker go to pay off his debt, but the dealer tries to shoot Baez. When she teleports behind him, he says he wants them to go into business with him. Before they can make a decision, the cops come in and a gunfight erupts, injuring Parker. Baez teleports away with him. Barry drops Caitlin off at home, where she asks if he's going to call Linda. She says he won't, and asks him for help getting undressed. He undresses and redresses her at super speed. She asks him to stay with her until she falls asleep, which he does. The next morning, she's hungover when she gets to S.T.A.R. Barry checks to see if she's okay, and she says she doesn't remember much from last night.Barry heads into the lab, where Cisco and Wells tell him that he let Piper get away. He admits that he has been obsessing over Ronnie because of his guilt over sealing him in. Caitlin tells him that he shouldn't. They get to the business of finding Baez and Parker; Wells has figured out that Baez can't use her powers if she can't see. Before they can do anything about this, Barry gets a call: his dad has been stabbed in prison. Joe and Barry arrive at Iron Heights, where he admits that he was looking for information for Joe and got beat up by the drug dealer's people on the inside. Barry is upset that he was kept out of the loop but Henry tells him that he wants to feel useful. Barry asks who beat him up, and Henry sells out a man named Julius. 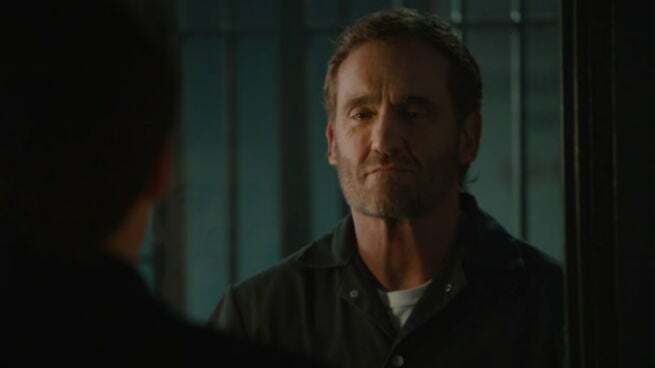 Barry suits up at super speed later and drags the man out of the prison, telling him that he will let the guards find the man "escaping" if he doesn't tell him the details of the dealer's next big job. He sells out the dealer and Flash takes off, leaving him to be found and penalizied for the escape attempt. On the outside, Flash finds Parker and Baez, and after a brief, powers-fueled fight with Baez, she teleports into the getaway car. As they're driving through a tunnel, Barry takes a wrench and breaks all the lights in the tunnel and her car, forcing her into darkness. Parker runs for it, leaving her stranded there. When they put her into the pipeline, they have mirrored glass on the inside, so she can't teleport out. She admits that she still loves Clay in spite of everything. Barry and Caitlin talk about last night, agreeing to move on from their exes. The Flash finds Iris on the street, leaving her a report about Clay Parker's breakout. She snaps a picture of The Flash as he leaves. At the Picture News later, Barry shows up to meet Linda, who works with Iris. He takes her off to lunch and Iris seems confused. After, Barry visits Henry in prison. Henry shows Barry a newspaper with The Flash on the cover, saying that he saw him once, watched him save Joe's life. He tells Barry that he heard The Flash also messed with Julian. He looks at Barry expectantly, and Barry laughs off the idea that he could be The Flash, but Henry tells him that if The Flash were his son, he'd tell him to be careful, that he's a hero and that he's proud of him. Barry is choked up, and smiles. In the sewers, two utility workers stumble across an area where the word "Grodd" is scrawled over and over again all over the walls. A gorilla grabs and beats them. Will we see former The Walking Dead actress Emily Kinney play a vastly different type of character to Beth on the CW's The Flash? Word is she'll be appearing as a female version of DC Comics character the Bug-Eyed Bandit, Bertram Brie Larvan, in a future episode. Punkd Images posted the pic below along with the caption: "#WalkingDead’s Beth.. @EmmyKinney arrives in VanCity to be #TheFlash’s new Bug Eyed Villian #BrieLarvan @SpoilerTV #YVRShoots @olv #HeardItHere1st." The Bug-Eyed Bandit was actually an Atom villain who created an army of mechanical insects as a means of pest control, but turned to crime in the process. We know Brandon Routh will be guest-starring in episode 18 (“All-Star Team-Up”) of The Flash as Ray Palmer, so perhaps that's when we'll see Kinney too. This has yet to be confirmed by anyone involved, but we'll update if and when that happens. When he returns to The CW's The Flash tomorrow night, recurring guest star Robbie Amell will be in a much different position than he's been since his first appearance in "Flash Vs. Arrow." This time around, Team Flash understands what happened to him and is ready to help...after, of course, a little fight. Along the way, we've seen that the jacket shared with journalists at the Television Critics Association will make its first appearance...but many fans have wondered: is that really the final costume? "Oh, not at all. I was actually a little upset when they posted the pictures that they did of the costumes," Amell admitted to ComicBook.com in an interview, the full text of which will run tomorrow. "It really just happens to be the jacket that Robbie's wearing when the splicer's put on. The splicer is removable in our version of the character. Whatever he's wearing at the time can be turned into the costume. I'm sure down the road, there will be a legit costume but for the time being, it's just whatever he's wearing at the time when the splicer's put on and then it's time to go to work, that happens to be the costume." He added, "I'm sure down the road, Cisco will make him some sort of fireproof thing and...he'll do something Cisco-y and he'll have a badass costume." The actor added that while nothing is yet set in stone after the next two episodes, it's likely that he'll return before the end of the season for at least one more story. The Flash airs tomorrow at 8 p.m. ET/PT on The CW. Full Batch Of Promo Images From THE FLASH Season 1, Episode 14: "Fallout"
Forget Barry and Iris. Forget Barry and Linda. Much like Arrow's Olicity, there's a growing movement for Grant Gustin's Flash to become an item with Danielle Panabaker's Caitlin Snow. Just one problem, she's Killer Frost! Due to the awkwardly cute events of the previous Flash episode, "Crazy for You"; there's a growing contingent of Flash fans who hope that Barry Allen eschews comic book cannon and somehow ends up romantically involved with S.T.A.R. Labs scientist Caitlin Snow. There was definitely a bit of geek chemistry between the two characters but it appears that Snow's destiny is firmly tied to Robbie Amell's Ronnie Raymond. And if that wasn't enough, there's the fact that Caitlin is one day going to become a heat vampire. 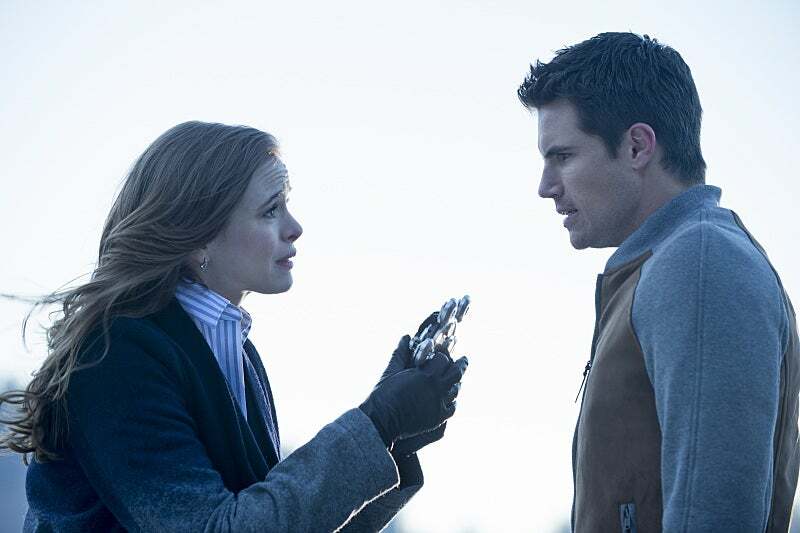 Speaking to Entertainment Weekly ahead of last night's episode, Firestorm actor Robbie Amell hinted that Killer Frost is definitely something the show would like to explore. " In an upcoming episode, you get a very small taste of the future of Killer Frost. But like you said, it’s definitely a ways down the road. I know that Danielle is super excited about it. I know they’ve been talking to her about it. I think it’s a matter of time. I’m sure they’ll start to manifest it shortly, but you have to see the development there, otherwise you’ll feel like you’ve missed a step." Tonight's episode of The Flash confirmed what many fans expected all along. Those last few holdouts will finally have to admit that [SPOILER] is a great danger to Barry (Grant Gustin). Despite Tom Cavanagh confirming that he was indeed the Reverse-Flash in the costume, battling Barry in the football stadium, many fans refused to believe that S.T.A.R. 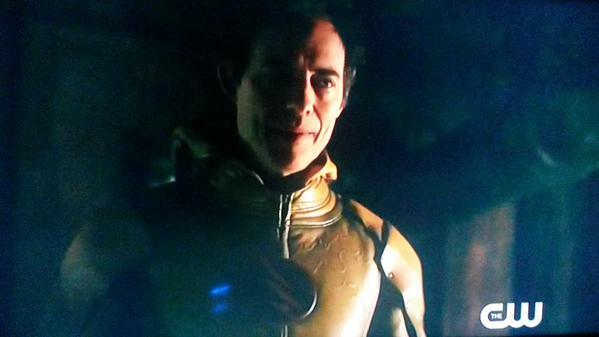 Labs' Harrison Wells was indeed the Reverse-Flash. Well, tonight's episode (particularly the last 45 seconds) certainly crushed those hopes. 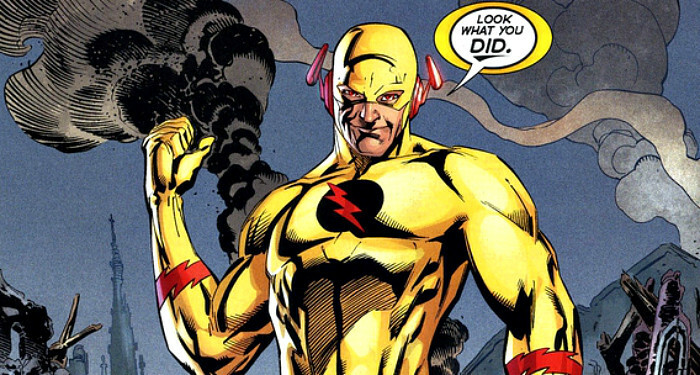 Check out the first look at Harrison Wells, unmasked, in the Reverse Flash costume. Unfortunately, the next new episode of The Flash is a month from now (March 17th) so DCTV fans will have a bit of a wait to see just what the fallout will be from this definitive revelation. Mark Mardon (Liam McIntyre) (aka The Weather Wizard), having survived his apparent death during the black-matter explosion, will return seeking revenge on Det. Joe West (Jesse L. Martin) for the death of his brother Clyde (Chad Rook), and is going to have the same weather-manipulation powers as his deceased sibling. I'm trying to get into this,, guess I never really read the comics when I was younger... it seems to jump all over the place..
'Golden Glider' Arrives In New THE FLASH Season 1, Episode 16 Stills; "Rogue Time"
Captain Cold and Heat Wave are back in Central City, but they've brought some backup in the form of the alluring Golden Glider (Peyton List, Mad Men). Hit the jump for over 20 images from "Rogue Time" as the villainous team continues to come together. Who will be next to join them though? CAPTAIN COLD AND HEAT WAVE RETURN TO CENTRAL CITY; PEYTON LIST GUEST STARS AS LISA SNART — The Flash (Grant Gustin) learns that Captain Cold (guest star Wentworth Miller) and Heat Wave (guest star Dominic Purcell) have returned to Central City. This time Snart has brought along his baby sister Lisa (guest star Peyton List) to help wreak havoc on the city. John Behring directed the episode with story by Grainne Godfree and teleplay by Brooke Eikmeier & Kai Yu Wu.